We welcome you and your guests for lunch and a presentation by Jim Gandy with WLTX, our very own local celebrity!! Jim Gandy is the Chief Meteorologist at WLTX-TV in Columbia and has over 42 years of experience as a professional meteorologist. He is a 1974 graduate of Florida State University with a degree in Meteorology. He has continued his education with postgraduate work in Atmospheric Science at the University of South Carolina. Jim was recognized for his correct forecast of the path of Hurricane Hugo onto South Carolina, his coverage of the 1993 superstorm, and the Lexington County tornado outbreak in 1994. 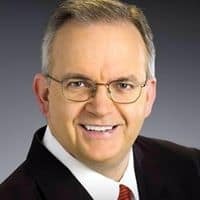 He has recently been named a Fellow of the American Meteorological Society, the first television meteorologist to be named. He has been recognized worldwide for creating a feature called Climate Matters that he uses in his reporting at WLTX in Columbia. Jim’s Climate Matters feature is also broadcast by over 600 television meteorologists worldwide. Jim was awarded the American Meteorologist Society’s Seal of Approval for weathercasting in 1985 and in 2009 became a Certified Broadcast Meteorologist (CBM) becoming the first CBM in the Columbia area. Jim has won four regional Emmy Awards and is the recipient of the Silver Circle Award from the National Academy of Television Arts and Sciences. Jim will be joining us to discuss Global Warming and Weather Trends. Which is a very current topic, so make sure to bring a guest, or 4 as this is sure to be a very important conversation.